Across most of Georgia, most producers have experiencing ample rain and plenty of forage, therefore, winter supplementation is far from their thoughts. However, now is a great time to start planning ahead. Typically, three large factors taken into consideration when selecting a supplement are convenience, cost, and nutrients supplied. Often times, we combine the latter two and look at cost per unit of nutrient (e.g. $/lb of protein or energy). Unfortunately, sometimes nutrients supplied are sacrificed to maximize convenience or low cost. Over past two decades, ethanol production has increased, and in turn, the byproduct of this industry (distillers grains) has become more available. 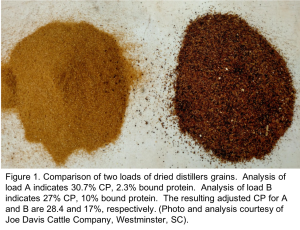 The growing popularity of this feedstuff has led to extensive research evaluating distillers grains in beef cattle production. In fact, several studies have been conducted at the University of Georgia in an effort to evaluate its value, as well as ways to utilize it in a convenient manner. For the remainder of this article, the discussion will focus on dried distillers grains with solubles (DDGS) because this is the most common form utilized in Georgia. 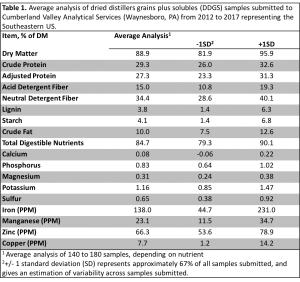 A summary of the nutrient analysis of approximately 130 DDGS samples submitted to Cumberland Valley Analytical Services (Waynesboro, PA) from the Southeast is presented in Table 1. This byproduct can be fed as a protein source to replace other more expensive sources such as soybean meal. 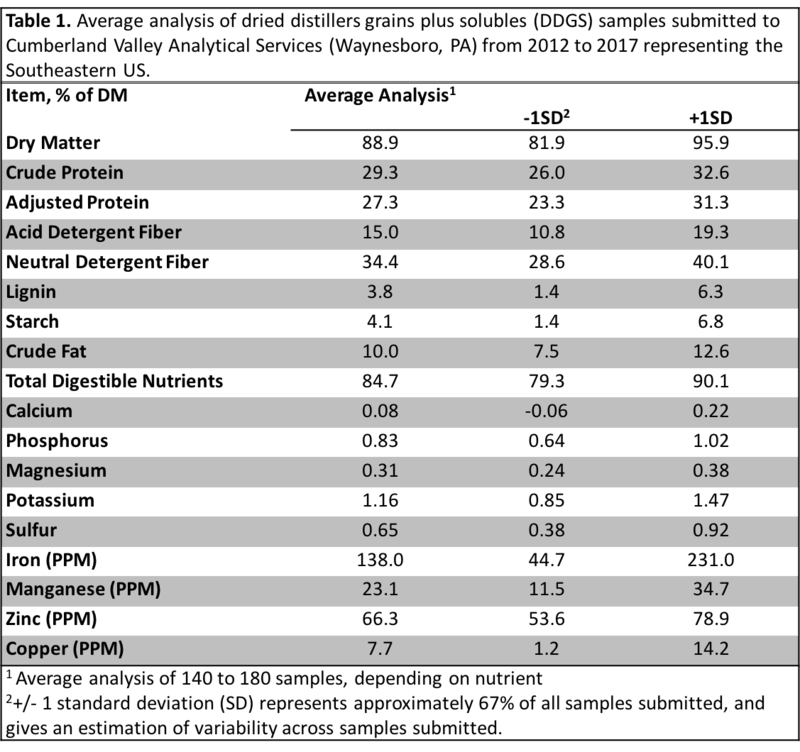 Distillers grains are also an excellent source of energy, often testing between 85 and 95% total digestible nutrients (TDN). The form of energy also makes distillers grains attractive for grazing cattle. Since the starch is removed, the energy derived from distillers grains is primarily digestible fiber and some fat. The mineral content of distillers grains should also be taken into consideration. Dried distillers grain is high in phosphorus (P) and sulfur (S), but low in calcium (Ca). Supplemental Ca should be provided to balance the high phosphorus levels to maintain a Ca:P ratio above 1.5:1. If this ratio stays low for extended periods of time, urinary calculi, or “water bellies” may occur. Also, excessive P excretion can have negative impact on water sources increasing the risk of algal bloom. Sulfur tends to be high and can vary widely between ethanol plants and can be as high as 1%. The total ration should remain below 0.4% S to avoid issues such as Polioencephalomalacia, or more commonly referred to Polio or “brainers”. Typically, DDGS should be limited to 30-40% of the total intake to avoid any negative impacts of excessive minerals while utilizing the protein and energy available. Distillers grains is high in moisture directly after the distilling process and is typically dried down to make transportation and storage easier. If excess heat is applied during the drying process, the protein in DDGS can be heat-d amaged and become bound protein. This reduces its utilization by cattle. This damage can easily be detected by visual inspection. Properly dried DDGS will have a light golden color; however, as it becomes heat damaged, it will darken in color and have a distinctive burnt odor. Figure 1 illustrates the visual difference in an undamaged and a heat damaged load of DDGS. Analysis of load-A, golden in color, indicates 30.7% CP and 2.3% bound protein, while load-B, darker in color, is 26.9% CP and 9.9% bound protein. 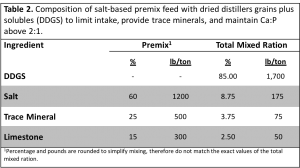 The adjusted CP, or available protein, for load –A and –B is 28.4% and 17%, respectively. This can create protein deficiencies if not taken into consideration when balancing a ration. lb for weaned heifers and 1.07 lb for bred heifers. A hot mix is a supplement that contains an intake limiter and allows a producer to put out enough feed to last several days with intake remaining relatively constant across that time. This results in a feed strategy that is more convenient than feeding on a daily basis. This DDGS hot mix could easily be utilized for brood cows and bulls. In fact, several producers have reported success stories from utilizing this strategy. Despite limitations with sulfur, phosphorus, and fat, distillers grains offer producers an additional option for protein and energy supplementation when cost is not prohibitive. Additional research has been conducted in Georgia evaluating distillers grains for developing bulls, stocker cattle, and finishing cattle. For information on the results of these studies, or assistance developing beef cattle rations utilizing distillers grains, please contact your local Extension office (1-800-ASK-UGA-1; extension.uga.edu). Additional information can be found in UGA Extension Bulletin 1482,Using Distillers Grains in Beef Cattle Diets. Posted in Nutrition. This entry was tagged DDGS, distillers grains, nutrition, supplement. Bookmark the permalink. Previous: Is cottonseed going to make my bulls infertile??? The University of Georgia's Beef Team is comprised of faculty members that are directly involved in beef cattle education. The goal of this team is to enrich the availability of beef cattle information for producers and County Extension Agents.